"Unfortunately, no one can be... told what The Dreaming is. You have to see it for yourself." He is known by many names: Dream of the Endless, Morpheus, The Sandman. At once an ephemeral figure and one of great might, he is perceived by the waking world only in fleeting glimpses. Of all the Endless, it may be he who takes his responsibilities to humanity most seriously. And in his own kingdom of the Dreaming, his power is supreme. Coming just one series after his older sister in 1999, Morpheus was actually the second Sandman figure DC Direct released: since their character selection was pretty limited at the outset, they had to pick some pretty weird folks to get toys, which is why Wesley Dodds, the Golden Age Justice Society of America Sandman, was put in Series 1 next to Wonder Woman and Swamp Thing. Morpheus, for the record, shipped alongside the Jack Knight Starman and Transmetropolitan's Spider Jerusalem. Things were weird in the late '90s. When Sam Keith was designing Morpheus, Neil Gaiman described the character, and Sam drew pages and pages of different faces trying to get it right. Once they'd picked one, the inker Mike Dringenberg pointed out they'd invented Peter Murphy, the lead singer of Bauhaus. Then they gave him Robert Smith's wild and unruly hair, and called it a day. 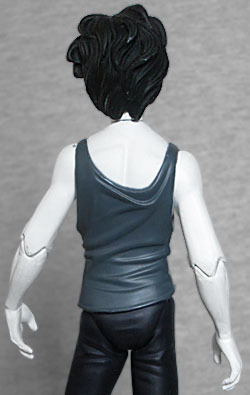 The sculpt on this figure is a bit thick and cartoonish - his hair ends up looking more like dreadlocks than an uncombed mop, and the wrinkles on his shirt are overly exaggerated. While Morpheus' thin frame came from ballet dancer Farukh Ruzimatov, his choice of clothes pretty much came straight out of Gaiman's hamper: brown shoes, black pants, and a grey tank top. This all contrasts with his alabaster-pale skin. Dream's eyes are solid black, matching his hair, and the figure's narrow face is sculpted with a wry smile and a cocked eyebrow; he looks like someone just said something that mildly amused him - maybe Hob Gadling at one of their centennial meetings. The articulation is precisely on-brand for DC Direct in those days: swivel neck and shoulders, hined elbows and knees, and a T-crotch. What? No waist? Why, what a strange and unexpected development this is! Even Death got biceps joints, but Dream gets nada. He's standing with all his weight on his right leg, leaning to the side much the same way that Jesse Custer was, but here it's sculpted correctly, so he doesn't end up looking like he has some kind of weird scoliosis. 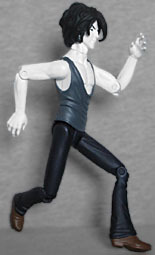 Sandman has two accessories: his tattered black cloak, which features a velcro closure at the neck, and his raven, Matthew, who was originally a character in Swamp Thing. Seriously! Matthew Cable was a government agent assigned to protect Alec Holland while the latter worked on his scientific research. Then a bunch of typically oddball comicbook stuff happened, and he died by drunk-driving his car into a tree. Well, coma first, then death; and since he died while in contact with The Dreaming, Morpheus was able to resurrect him as a raven. Not as a man in the body of a raven, but as a raven. 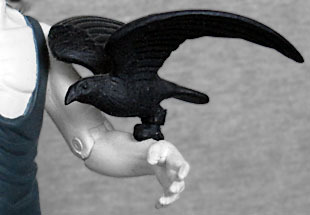 The sculpt of Matthew is as stylized and rounded as his master, with his wings raised, and a peg in his feet fits into Sandman's left forearm (at least, it does until it breaks off, which it almost certainly will do). There is a variant figure available as well, because that's the way DCD rolled back then: every toy got two versions. Sandman's variant shows him wearing his helmet or crown or whatever it is - reportedly made of the skull and spine of a defeated enemy, the mask has a superficial resemblance to an old-fashioned gas mask, which (in kayfabe) was the subconscious inspiration for Wesley Dodds wearing the same thing in his superheroic career. And in the real world, it was the inspiration for the alien race "the Gaim" on Babylon 5! 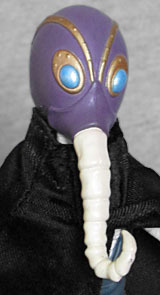 On this toy, the helmet part is purple with golden trim and metallic blue eyes, and the spine is white. Since I got both versions, I keep the standard Sandman looking casual, and give the cape and bird to the variant. This wasn't the last Sandman of the Endless figure DC Direct would make, but it's certainly the most desirable - it looks like the character's average depiction, while the others were more story-specific. We could still use a modern toy of him, made to today's standards, but this one isn't terrible.